Published in Errors & Omissions on 09/12/2017 by Harry Lew, Chief Content Writer. Who doesn’t like ratings—Yelp for restaurants, Amazon for just about any conceivable product, Consumer Reports for cars and major home appliances, Angie’s List for builders and other service providers? Whatever the product or service, consumers love to peruse information that gives them the ability to buy with confidence . . . or walk away from a bad deal. First, they help agents and advisors—you—select an E&O insurer that’s strong enough to meet its financial obligations, not just now, but decades from now. The stronger its financial standing (as measured by ratings), the more likely it will be able to pay for your E&O costs if you lose a client lawsuit. So if you want your E&O insurance to be there when you need it, evaluating an insurer’s ratings before you sign on the dotted line is extremely important. Second, insurer ratings also affect whether your E&O insurance policy will defend you in the event a carrier you recommended becomes insolvent and a client sues you as a result. Many policies typically include an “insolvency exclusion” if you place a customer with an insurer that has ratings below a certain benchmark (typically B+ on the A.M. Best scale). If you stay at or above B+ and the insurer subsequently has a rating downgrade after you sold the policy and fails, you’d likely have E&O coverage for a resulting lawsuit. But if you sold a lower rated policy, the company would exclude coverage. Third, insurance companies and marketing organizations might require you to have E&O coverage from a higher-rated insurer in order to contract with them. Not paying heed to E&O insurer ratings might literally prevent you from getting appointed with an insurance carrier or marketing organization. Fourth, because economic conditions are always in flux, insurer financial condition will wax and wane. Always keep an eye on rating changes for the companies in your product portfolio, letting clients know when their company gets downgraded. Although most courts have ruled that agents have no continuing duty to monitor—and report on—an insurer’s worsening financial condition, a few have imposed a duty on agents to advise their clients if they know or reasonably should have known an insurer is becoming insolvent. Checking ratings should be part of that process, but doesn’t absolve you of liability if the ratings were good, but other factors should have tipped you off. For the above four reasons, having a solid knowledge of insurance-company ratings will not only help you purchase high-quality E&O insurance that will be there when you need it, it will also help reduce your risk of getting sued in cases where a company you recommended to a client goes broke. What should this knowledge entail? The starting point is knowing which rating systems are available and how they work. Then it’s important to decide for yourself which ratings will disqualify a company in your eyes, all things being equal. With that, let’s briefly look at the major ratings firms and their rating systems. A.M. Best Company: A.M. Best Company ratings are considered the gold standard. It’s no surprise why. The company has been evaluating insurance companies for more than 100 years and has a sterling reputation for independence and credibility. A++ and A+, which constitute its Superior ranking. This means companies have demonstrated superior overall performance and have a very strong ability to meet their obligations to policyholders over a long period of time. A and A-, which are considered Excellent, meaning they have demonstrated excellent overall performance and have a strong ability to meet their obligations long term. B++ and B+. which are held to be Very Good. Such companies have shown very good overall performance and are expected to evince a good ability to meeting their obligations to policyholders long term. A. M. Best analysts consider the above six ratings to be secure. Any company in this group should generally be a safe bet to provide benefits when your clients need them. There are nine rating categories below secure, ranging from B and B- (Adequate) to E (under state supervision) and F (in liquidation). Standard and Poor’s: S&P has an even longer track record than A.M. Best, being founded in 1860. It also has a broader focus than A.M. Best, providing financial market intelligence on many different kinds of firms and industries, with a focus on credit worthiness. Although its credibility took a hit after it inaccurately rated the financial instruments that caused the 2008 global meltdown, it has recovered ground by tightening its standards and procedures. AAA (Superior), which means the company delivers superior financial security on an absolute and relative basis. Its capacity to meet policyholder obligations is extremely strong under a variety of economic and underwriting conditions. AA (Excellent), which denotes an excellent financial security. The company’s ability to meet policyholder obligation is very strong under a variety of economic and underwriting conditions. A (Good), which stands for good financial security. However, the company’s ability to meet policyholder obligations is somewhat more susceptible to adverse economic and underwriting conditions, but still strong. The above three ratings constitute S&P’s secure range. Below that, it has five additional rating categories that are considered vulnerable, ranging downward from BBB (Adequate) and BB (Adequate) to B (Vulnerable), CCC (Extremely Vulnerable) and NR (Not rated). Moody’s Investor Services: Moody’s Investor Services is a subsidiary of Moody’s Corporation and provide credit ratings, research and risk analysis, with a specialty in bond credit ratings. 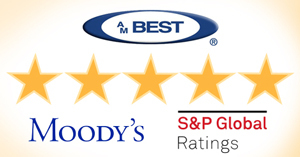 Moody’s offers a somewhat more granular ratings scheme than A. M. Best and S&P as follows. Aaa, which indicates exceptional security. These firms are unlikely to be affected by external changes. Aa, which stands for excellent security with somewhat larger long-term risks. A, which connotes good security, with some possibility of future impairment. Baa, which suggests adequate security, with some suggestions of future impairment. Ba, which indicates questionable security, with only a moderate ability to meets its financial obligations. B, which stands for poor security, meaning the insurer will have a low likelihood of meetings its financial obligations on a timely basis over the long run. The three lowest ratings—Caa, Ca, and C—suggest dwindling chances of the firm meeting its financial obligations. Moody’s also adds a numerical qualifier to provide finer distinctions within some categories—with 1 at the high end to 3 at the lower end—for ratings categories Aa to B. Although there are several other ratings agencies, including Fitch, Weiss and Demotech (for P&C companies), another service places the major ratings on a single 100-point scale. With this system, you can compare ratings based on a common percentile scale. The higher the percentile, the higher the overall rankings from all the rating firms. In other words, an insurer with a 90% Comdex rating has a stronger composite rating than 90 percent of all insurers with ratings. How to make sense of all these insurer data points? The key is to not get stuck “in the weeds.” Here are some tips you might find useful. Don’t look for specific grades as much as relative positions across ratings scales. Focus on picking carriers that are in the higher or stable strength categories rather than those that have the absolute highest ratings. Don’t assume that there will be huge differences between firms with A++ vs. A+ A.M. Best ratings. It’s more meaningful to focus on the differences between firms that are several categories apart (for example, an insurer with an A++ vs. B++ Best rating). Even so, it’s always helpful to take ratings with a bit of skepticism; they tend to be blunt, rather than surgically precise, instruments. Don’t assume highly rated companies will produce better results in terms of interest rates and dividends paid to clients. Ratings only reflect their ability to manage the risks and liabilities they agreed to shoulder, not the performance of their specific life or annuity contracts. Don’t automatically discount a lower rated firm (as long as it still has a greater than B+ rating from A.M. Best). Since products from the highest-rated insurers often cost the most, it may make sense to use a lower rated firm in order to save a client some money. Just make sure to disclose the ratings and your thought process around them so the client can make an informed decision. Finally, try to get your ratings directly from the organizations that produce them rather than from the insurers themselves. That’s because in the latter case, companies will surround the ratings with marketing language to frame the rates most positively. It’s best to get your information unvarnished and direct from the source and then make up your own mind. In summary, insurance company ratings are crucially important when it comes to both buying and keeping your E&O insurance. If you know how to do your carrier due diligence—using ratings to help buttress your judgments—you will be well-equipped to select a great E&O policy for yourself and to avoid E&O disputes with your clients. You will also have fewer headaches securing and maintaining your carrier and marketing organization appointments. Carefully reviewing insurance company ratings will always pay big dividends in terms of building a successful, sustainable low-risk business going forward.